In this modern retelling of H.G. Wells' sci-fi classic, civilization is laid to ruin when a race of super aliens invades Earth. The Invasion Has Already Begun. Lt. Samuelson: Assault on one of my officers is punishable by death in my new world. Sgt. Kerry Williams: It's okay, sir. It's okay. I fell. Remember George here, sir? He's the astronomer. His brother is a Ranger. Lt. Samuelson: Rangers are pussies. I haven't seen one of those assholes in over a week. The Asylum put their name in the headlines with this "mockbuster" that was released just prior to the highly anticipated Steven Spielberg-Tom Cruise hit. In this film, father and husband (C. Thomas Howell) must try to make his way to Washington, D.C. to his wife and kid but along the way he must battle with aliens who have come to Earth to destroy it. Keeping with The Asylum's reputation, this here is a pretty poor film and there's really no point in trying to compare it to the much bigger and much better film from Spielberg. I doubt anyone went into this thing thinking it could compare to the "other" film but I did at least hope to be entertained in a "B" movie way but that didn't happen. The biggest problem with this film is that there's not an inch of life to be found anywhere as the entire thing is just so poorly paced that you're cheering for the aliens to wipe everything out by the ten minute mark. The majority of the 93-minute running time is devoted to extremely long patches where nothing is going on except for the characters walking around talking. Howell's character pretty much has to walk to Washington, D.C. and along the way he meets various characters who walk with him and give him someone to talk to. These long patches of dialogue sequences are just so boring that you'll be wishing just about anything else would be happening. Even worse are the "dramatic" scenes that are supposed to make us feel for the characters but they just make us care less about them. Check out the sequences with the raving woman talking about how much she hates God. For the most part Howell gives a good performance but there's simply nothing here to work with. The supporting players also don't have much to work with so no one really stands out. 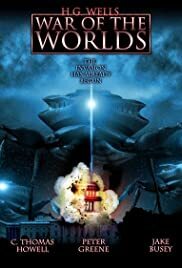 WAR OF THE WORLDS, Asylum style, is a complete failure from start to finish and don't even get me started on the special effects.